Ken Estey is an associate professor of Political Science at Brooklyn College and the author of A New Protestant Labor Ethic at Work. His research centers on the intersection of politics and religion with a particular focus on labor and Christianity. When I heard over breakfast that Billy Graham had died, the news ricocheted around my mind and stirred up lots of memories. The counter of George’s Diner on Coney Island Avenue in Brooklyn was just the place to begin reflecting on the surprising connection between Graham’s legacy and organized labor. I came of age in the early 1970s during one of the high points of Graham’s influence. A friend of Richard Nixon, and rightly criticized for that relationship, Graham’s world-wide evangelistic “crusades” continued apace. In 1973, Graham preached to 3.2 million people in a series of services in Seoul, South Korea. The final service on June 3 drew 1.1 million people, most of whom had traveled to Seoul on foot to hear him. According to the Billy Graham Evangelistic Association, it was the largest crusade his team ever organized. Over the years, Graham eventually preached in 85 countries on six continents, reaching 215 million people. 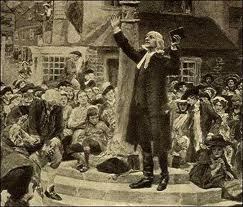 I recall little of his much-lauded preaching. What caught my ear, rather, was Graham’s singular manner of invitation to come forward to receive Jesus. I can still hear the signature hymn “Just As I Am” sung by the crowd as individuals soulfully walked forward. As they did, Graham would assure the soon-to-be-converted and particularly those who had not yet made a decision that “the buses will wait.” While he made no specific reference to class, Graham’s invitation to receive the good news of Jesus was plain and unadorned, suggesting that you didn’t need to be somebody special. All you had to be was who you were and ready to receive God’s grace. In my working-class household, this was a theology everyone could work with. If the way to receive the gospel was just an old bus, so much the better that it would wait! Neither a prosperity gospel nor a liberation theology, Graham’s message did not promise riches or a revolution, but rather an everlasting reward in heaven. Heavenly rewards have long been the promise of what IWW bard Joe Hill called “long haired preachers.” Such preachers are long on words but short on food: “You will eat, bye and bye, in that glorious land above the sky; work and pray, live on hay, you’ll get pie in the sky when you die.” American evangelicalism, with Billy Graham at the lead, thus seems an impoverished place to ponder labor issues. But according to Graham, evangelicals did not forsake labor. Rather, labor has forgotten that its very source is evangelicalism itself. On the Sunday before Labor Day in 1952, Billy Graham preached in the Great Auditorium at the historic Ocean Grove Camp Meeting Association. Methodist ministers created this “place of respite where ‘religion and recreation should go hand in hand’” in 1869 to get away from the “stresses and pressures of society.” On that day, before the official kick-off of the presidential campaign between Dwight D. Eisenhower and Adlai Stevenson, Graham told his listeners that millions of Americans were anxiously awaiting to hear what the candidates had to say about the grave issues facing them, including the still raging war in Korea. But he also pointed to an apparent bright spot, “the laboring man and his family.” Noting the extraordinary growth of unions in the past fifteen years, he commented that “perhaps fifty to sixty million American people are directly or indirectly connected with organized labor.” Labor, Graham reminded his audience, had become a “dominant economic and political force” with “tremendous power.” He also admitted to his disappointment that church leaders were neglecting organized labor. Graham was not simply an evangelist; he was also a consummate organizer. His advance teams would work with churches and organizations in a given city or area well before an evangelistic crusade. After Graham’s appearances, the newly converted would then be directed to area congregations while Graham and his team would move on. Graham couldn’t understand why ministers would always direct his team to industrialists and political leaders but not to labor leaders. Yes, Graham saw organized labor as a mission field. He argued that the church “should be impartial toward the labor union as well as to other economic groups.” One should not “place halos on the heads of one group and horns on the heads of another. We must treat all with equal fairness and try to be neither pro-labor nor pro-capital.” This may seem like a surprising statement from an evangelical, but Graham’s evangelicalism was quite different from today’s Christian Right. And to be sure, Graham the organizer would not want to alienate a potential soul-mine of redeemable sinners. But I think Graham also had something else in mind in his non-hostile view of the labor movement that day. He was attentive to history, particularly to an ecclesiastical history that traced a whole bevy of reform movements, including organized labor, to the religious revivals of the early eighteenth century. As he told his Methodist audience at Ocean Grove, who might have been eager to hear about their spiritual forebears, “you should remember that the trade union movement started as a result of a great spiritual revival. The heritage that labor unions have comes from the church and from the great Wesleyan revivals of the eighteenth century.” Graham underlines this point later in the sermon: “Our great labor unions of America today owe everything they have and are to the great revival under Wesley.” In the absence of these revivals, Graham emphasized that there “may never have been organized labor as we know it today.” Graham’s position on labor in the early 1950s was not unique among the evangelicals who spoke to social issues in those years, hard as it is to imagine how an evangelical today could be even provisionally favorable to a labor perspective. The occasion of Billy Graham’s death reminds us that his organizing prowess helped create the evangelical era, but evangelicalism in the United States has evolved over time, with many branches that seem to be going their own ways. Evangelicals once explicitly distanced themselves from the fundamentalists to their right, despite overtures from leading fundamentalists to join them. To be sure, most evangelicals in the 1950s were pro-capital and anti-labor, as they are now. But evangelicalism fills a very capacious tent, and we should not forget those, like Graham, who saw labor as an inhabitant under that canopy. Graham’s death calls our attention not only to his long ministry but also to the surprising range of his perspective over the years. There is plenty to criticize in Graham, and most of us would rather focus on the future rather than on this highly problematic figure of the postwar era. Yet if we take seriously Graham’s implicit instruction to pay close heed to history, we can imagine that there might be other instructive connections between working-class perspectives and religion. For a labor movement in free-fall, looking backward might be the best way to look ahead.